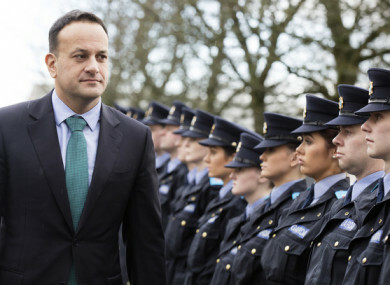 Taoiseach Leo Varadkar reviews a trainee guard of honour on his first visit to Templemore Garda Training College in County Tipperary. TAOISEACH LEO VARADKAR has told new Garda members that their “greatest loyalty is in providing a solid blue wall in support of justice”. Highlighting Justice Charleton’s report on the Disclosures Tribunal, the Taoiseach told the newest members of the gardaí that there is a need for a culture change within the force, “one in which people at all levels of the organisation, without fear or favour, share ideas on opportunities and problems”. He said there is also a need for a culture of shared accountability and one in which “no-one ever hesitates in to speaking truth to power “. “I hope that in the years to come you will look back on today with pride that you were the recruits who entered at that moment of change. You embraced and owned the new culture,” he said. Varadkar also mentioned the changes recommended by the Commission on the Future of Policing in Ireland and the told the new recruits that Garda Commissioner Drew Harris is determined to drive reform and modernisation. “His primary focus is to protect the public and his members. From my meetings with him, I know he is determined to make swift progress on the issues that have been raised by Gardaí – including rosters, uniforms and appropriate resources, such as ICT – to help you do your job,” said the Taoiseach. “Those who put on the uniform are called to perform the highest service in the land. It is a responsibility you have willingly accepted and we thank you for it,” he told graduates this afternoon. With criticisms levelled at the force in recent years about the pullback in community policing, the Taoiseach specifically mentioned the importance of it. “As you embark on your careers, remember that many people will spend the most difficult times of their life in your presence. In the aftermath of a sudden bereavement, a mental health crisis, or during the anxious wait for a missing loved one, they will turn to you. This is a huge responsibility and one I know you are ready for. “You have the power to make a positive impact. You have the power to save lives. You also have the power to change lives. The future is in your hands,” he concluded. Email “Taoiseach tells new gardaí: 'Your loyalty is not to the person in the uniform. It is to the uniform and all that it stands for'”. Feedback on “Taoiseach tells new gardaí: 'Your loyalty is not to the person in the uniform. It is to the uniform and all that it stands for'”.